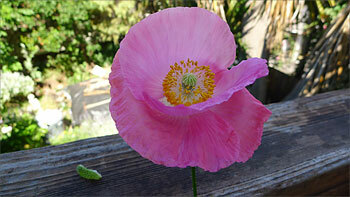 This poppy sprouted in a pot with a cutting from the princess tree, living on the porch. What a surprise, I love volunteers! 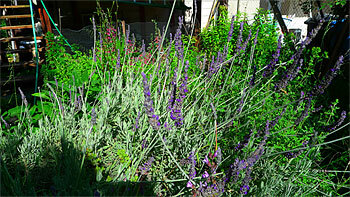 This lavender in the herb spiral is very prolific. I wish I could remember which variety this was, because it smells great and has a deep, almost blue/purple flower. 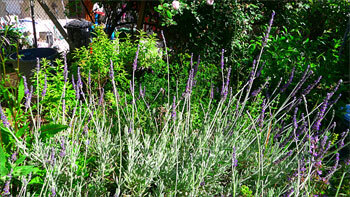 The sage (salvia officinalis) has just finished flowering, and I cut back the seed heads, which looked great with the lavender. 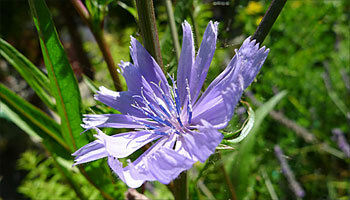 Here’s the red-ribbed italian chicory, which is often sold as dandelion, and makes such good eating. 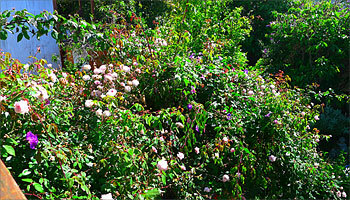 This is the last photo of the cecile brunner rose canopy, which came back from nothing last year. 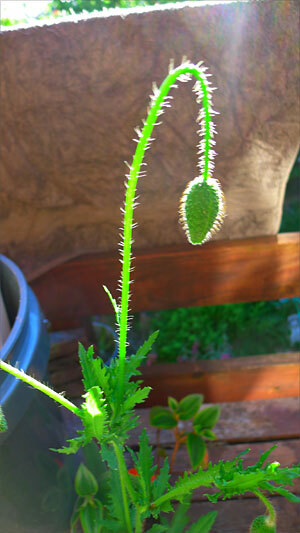 Since taking the photo last week, I’ve chopped it way back again, to gain more sun and lose climbing access for the demon morning glory, which you can see flowering on the left. Next time you see it, it’ll be much smaller and tidier. The birds will lose some habitat, but they have so much to choose from. Though it breaks my heart to cut such fragrant blossoms, I’ve gotten much tougher! 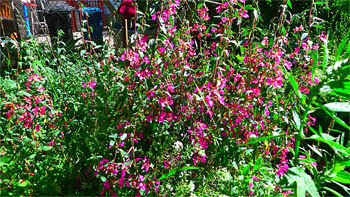 Your plants are looking particularly exhuberant on this June Bloom Day. Must be the compost! 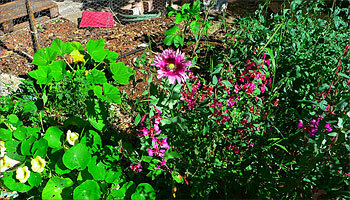 Happy gardening and happy Bloom Day!